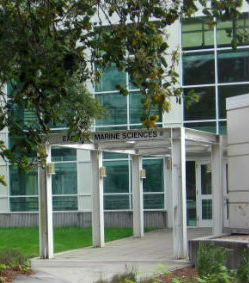 The Ocean Sciences Department office is located in Earth & Marine Sciences Building, Room A312. Parking permits are required and can be purchased at the main kiosk when entering campus. Proceed north on the main road, Coolidge Drive, as you drive around the eastern edge of campus. Coolidge then turns into McLaughlin Drive after a sharp curve to the left. Continue until you reach Heller Drive and turn left. The Core West Parking structure entrance is immediately to your left. You may walk to our building from there. Some disabled parking is located at the building. This may be accessed via Red Hill Road. 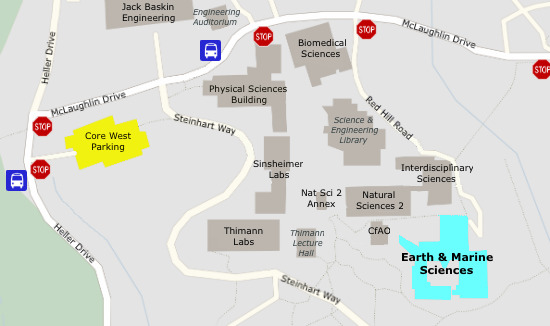 The UCSC Visitors website also provides maps, directions, and detailed parking information, as well as organized tours, virtual tours, and other programs for those wishing to visit the campus.